Who Has Nourished Your Life? The short answer to the dispute we read about in our lesson from John is love. The longer answer fills thousands of books. The longer answer rationalizes and divides churches and separates Christians from each other. The longer answer recognizes there is bread aplenty but still leaves us hungry. I prefer the short answer and I wonder if Jesus does as well. The longer answer keeps me stuck in my head, trying to make sense of senselessness. When I think of the short answer, however, I begin to list people who have fed and nourished my life with their flesh and blood – through real incarnate lives of presence, generosity, forgiveness, strength, courage, guidance, and love. Sometimes these people challenged me and held me accountable, and at other times they encouraged me by showing me more than what I could see for myself. They called out of me the very best of who I was. They pointed me to beauty, both within myself and in others. They have enlarged my life. *Originally written for and published by Forward Day by Day. I am grateful to Forward Movement for giving me the opportunity to write meditations for the month of March. 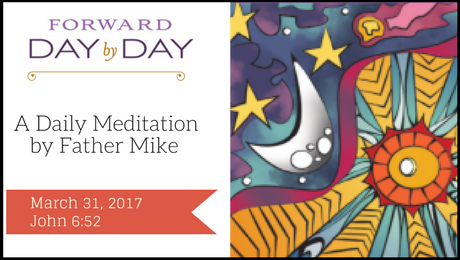 Today’s meditation is my last one for the February-March-April 2017 issue of Forward Day by Day. The longer answer fills thousands of books … millions!!! Many have seen the best in me and encouraged me to be more than I knew I could be. I am thankful for my parents, my family, my teachers and friends for “nourishing” my inner “seeds” to grow into mature plants, I utilize today.